Optimize the position of your site on the Search engine result pages. The Prestashop SEO Expert module automates the entire process of adding meta tags, site mapping and interlinking for SEO purpose. Ranking higher in the Google's SERP is the biggest concern of the eCommerce sites. Getting the SEO done in a proper way is the key to this. Prestashop SEO expert addon makes it easier for the e-marketers to get their store indexed with least effort. The Prestashop SEO addon automates the entire process of interlinking in the site and sitemap of XML file creation. This Prestashop automated site interlinking Module saves your precious time and makes search engine optimization easy. SiteMap creation: The Prestashop XML file creation Extension offers an easy way to create the XML file of the various types web pages. 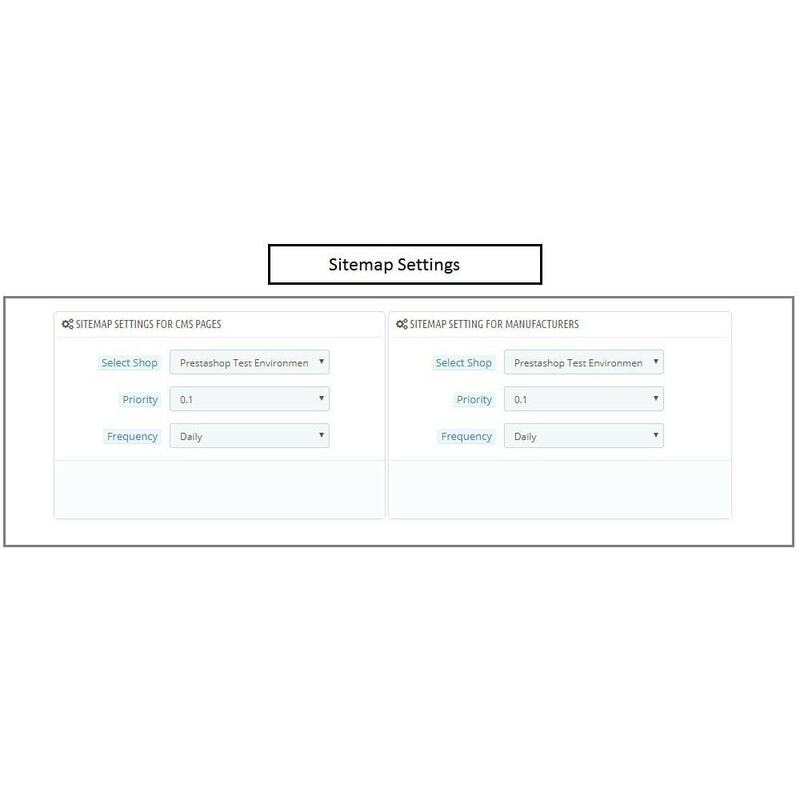 The admin gets an option to create the sitemap of either the product page, category page, CMS page or the manufacturer page. Just select the page and the store and the file will be created with a click. 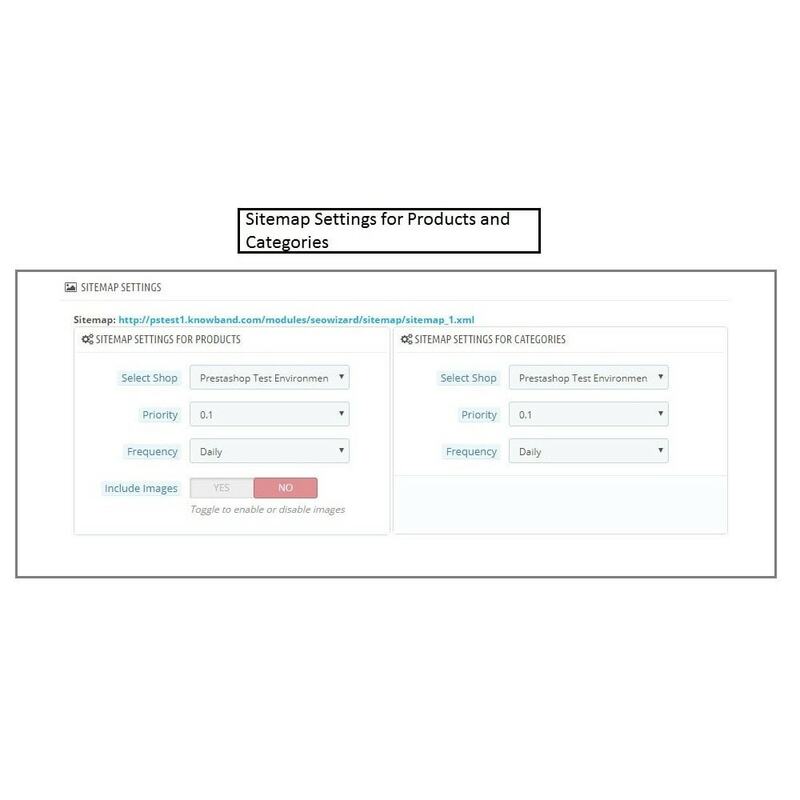 The admin can even create the sitemap of product images if needed. Adding Meta Tags: The Prestashop SEO Expert Extension also allows the store merchant to add the meta titles, description, and keywords for each product and category page in a few button clicks. Website Interlinking: The Prestashop automated site interlinking Module makes keyword interlinking easier for the store admin. The URLs can be interlinked to the anchor text just by making a few changes in the back-end of the admin interface. This Prestashop SEO addon ensures that all the web page of the site is crawled. Thus, boosting the chances of ranking. The linking can be done in any of the above-mentioned web page types as per the need of the admin. Web Page Optimization: All the changes done in the back-end of the admin panel can be implemented on the front-end of the site on a button click. Once the pages are optimized as per the SEO requirement, the store can have the visibility it deserves. The Prestashop SEO Wizard Module automates the entire process of interlinking and site mapping. This Prestashop XML file creation Extension allows the e-merchant to set the priority of the various web pages of the site. Even the crawling frequency of the pages can be set from the back-end. The frequency can be set to Daily, Weekly, Monthly or Yearly basis. The Prestashop SEO expert module is multi-store compatible. 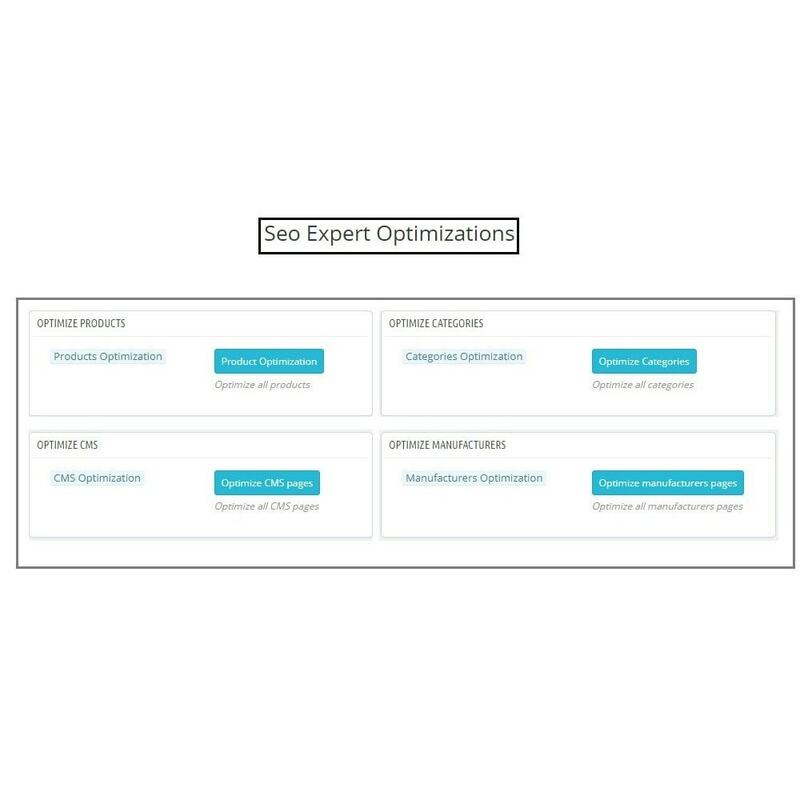 Thus, the search engine optimization can be done in multiple stores with the help of the addon. The admin just needs to select the store in which he wants to make the changes. 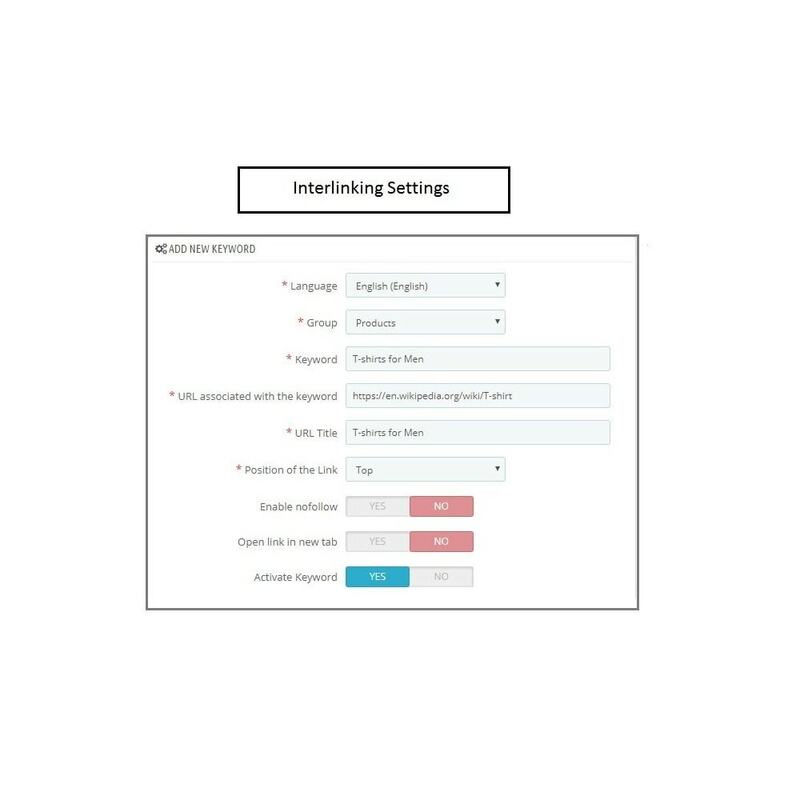 The Prestashop automated site interlinking Module is multi-lingual compatible and allows interlinking in various languages. You can improve the ranking of your site in various languages. The Prestashop SEO expert extension enables the store owners to insert a nofollow or dofollow link if the need occurs. The feature of opening the link in a new can be incorporated at a button toggle. The keyword can be activated or deactivated by a button click. The Prestashop SEO Wizard addon makes SEO easier for the e-merchants and thus allow them to rank at a higher position in the search engine. This Prestashop SEO expert extension makes it easier for the customers to find you on Google. Your customers can easily view the products on the search engine result pages.